Eleanor Stolar, Ed Dzielenski and Mary Benoit Houser of Longmeadow were honored last night at the Log Cabin restaurant as recipients of The Reminder Hometown Heroes award for 2009 for their time and service commitments to our community. See the complete story including photos at The Reminder website. 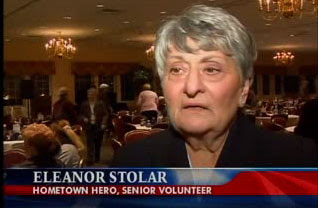 Eleanor was interviewed and appeared on last night's 11 PM news. Click here to view the television interview. Congratulations to Eleanor, Ed and Mary and this year's other recipients. We thank all of them for their dedicated service to our community. During the Massachusetts Municipal Association Conference the Governor stated that Chapter 70 money (State Aid for Education) would be "level-funded" under his proposal for FY2010 - with everything else as a potential cut target. At the Regional Board of Selectmens' meeting last week, State Senator Canderas reinforced the Governor's comments and further added that the vibe in Boston was that 2011 would worse than 2010. As we read, listen, and absorb experts' opinions on the impact of our daily and future economic condition - I would prefer to construct 'conservative' budgets. Therefore, in terms of the FY2010 and FY2011 budgets - to create the former without consideration of the latter would place Longmeadow in a precarious position to meet services, secure bonding, or generally function as a thriving concern. My approach to budget strategies has always been to listen to each professional regarding their needs as they view them from their departments, weigh priorities and shared values/ missions, and finally craft an acceptable proposal. The key here is getting the 'best snapshot' projections as well as agreed upon priorities, gain consensus with committees/dept heads/taxpayers, and take action. I take this very seriously and will continue to gather the best information to make credible decisions.